Martin O'Neill says the door remains open for a Republic of Ireland recall for Stephen Ireland but that the Stoke player must make his intentions clear. Ireland, in international exile since 2007, has not been included in a 32-man squad for the Republic's four upcoming end-of-season friendlies. However, O'Neill insisted the Stoke midfielder's "slate is clean". "If he wants to play again, I'd rather hear from him but if he doesn't want to, fine," added the Republic boss. Ireland, 27, has been in international exile since 2007 but he has been linked with a possible return to Republic duty after holding some discussions with O'Neill in recent months. The Corkman has has not played for his country since he lied about the death of both of his grandmothers after pulling out of an Irish squad seven years ago. The Stephen Ireland issue apart, there were few talking points in O'Neill's 32-man squad for the games against Turkey, Italy, Costa Rica and Portugal. Experienced defender Richard Dunne has been left out because of his involvement in the Championship play-offs for QPR. After being troubled by injury for the previous season, Dunne has played 42 games in QPR's campaign although he was rested for last week's match against Barnsley. Everton's Shane Duffy and Newcastle keeper Rob Elliott are the only uncapped players in the 32 but both have been in previous squads. Robbie Keane returns after missing the friendly defeat by Serbia in March. With Dunne missing, Everton defender Duffy and West Ham's Joey O'Brien are drafted into the squad while Derby striker Connor Sammon is also recalled. 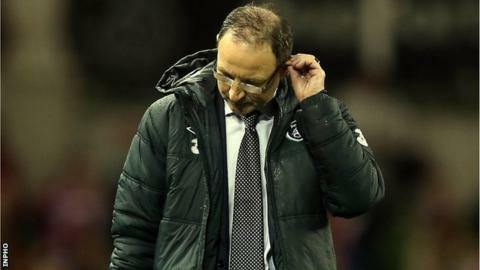 Nottingham Forest midfielder Andy Reid remains unavailable because of injury after undergoing a hernia operation in late February. LA Galaxy striker Keane is included after being excused from the Serbia match because of the start of MLS season in the US. O'Neill's side face Turkey in Dublin on 25 May before taking on Italy at Craven Cottage in London on 31 May. The Republic squad will then travel to the US for games against Costa Rica in Philadelphia on 6 June and Portugal in New Jersey on 10 June.